Cosmic-shocker Uranus; New Moon in Libra—zodiac sign of partnership; and an Equinox too. Whew! Yogastrology draws yoga together with astrology, aligning us with powerful celestial energies. And as we come into greater and greater alignment, within as well as with the universe around us, we open ourselves to receive more prosperity. And automatically we give more of ourselves too—we share our gifts freely with the world. September 23 is the date of the (autumnal/northern) Equinox. Equinox means equal. This Autumnal Equinox is a time to invite greater equality, balance, and equanimity into our lives. Think: giving and receiving. Right livelihood (work) balanced with restful playtime. Light and dark. Dawn and dusk. Yin and yang. Balance has an effect on the nervous system: we’re soothed. Let's offer gratitude, around the time of the Equinox, for balance. Right after the Equinox, the New Moon happens on September 27. Every New Moon aligns with the shimmering Sun, which adds high energy to the mix. Use this rich New Moon energy to dive within and meditate. Set intentions for the upcoming cycle. Change — new beginnings — fresh intentions — all standard New Moon fare. But this New Moon involves more innovation and unpredictability than usual. The reason: Uranus. Uranus spells change with a capital "C." On September 27, the New Moon opposes change-inducing, cosmic-shocker Uranus. This planetary opposition indicates a celestial—and since the Moon is involved, emotional—tug-o-war. Who will win this tug-o-war? You, that's who. Uranian energy is all about unpredictability, liberation, and innovation; it’s volatile and intolerant of that which is outdated. Use this electrified energy to become very innovative. 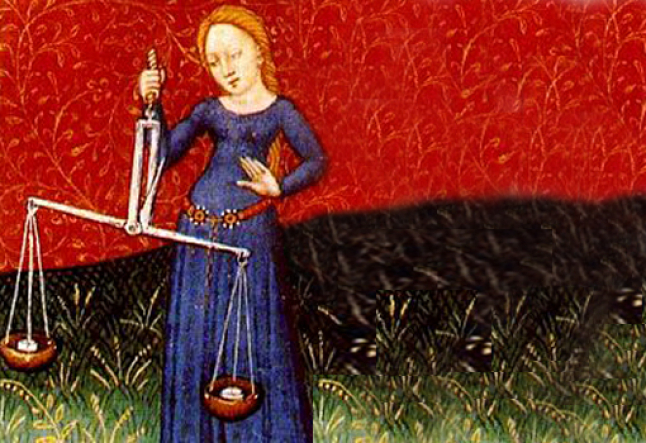 This New Moon (4°- 5° Libra at 4:09 am Pacific Time) falls in the sign of Libra, which is the area of the zodiac most closely related to partnerships and relationships. Because of Uranus' influence on the Libra New Moon, it is possible to liberate ourselves from an outdated way of relating now. Yogastrology theme for the month of Libra: Giving and Receiving—and it's time to contemplate. Ask yourself, do I need to be more giving with people? Does someone I love deserve more of my time and attention? It may be time to receive more of that which you truly value too. Let this once-a-year New Moon in Libra help you regain balance throughout all important relationships. Set your intentions. And do yoga to back it up. Partner poses. I love Child’s pose, especially when it's done as a partner pose with that delicious lower-back press—feels like a mini-massage. Practice giving and receiving in a variety of partner poses (Libra, the sign of partnership: September 27 New Moon happens in Libra). Maake contact with your partner gently, with love. Cat-cow pose. Do this pose focusing on the lower back. Lead from the lower back in the forward movement of the pose; lead from the lower back in the backward phase of the pose too. Balance front body with back body. Meow. Locust pose. Lie down, face down, and plant imaginary roots deep in the earth to stabilize the body: press lower back down, toward the earth. Now lift all four limbs and extend up and out. Sail on the wind. Freedom in our bodies equals freedom in our lives. Think: September 23 Equinox = equal. Note: Vedic astrology, Jyotish, places this New Moon in Virgo. We can focus on the abdomen = Virgo AND on the lower back = Libra at the same time. Achieve balance, front-to-back. Powerful to the core. Yum. Remember, this New Moon may bring unpredictability, perhaps even emotional reactivity, with Uranus in the mix. Move with the energy. Call upon your most innovative self to make powerful new beginnings. Yogastrology theme for the month of Libra: Giving and Receiving. May you prosper, in the truest sense—receive genuine good fortune. And may you see more and more ways to give your greatest gifts to the world. Share your light. Yogi Times readers **receive a complementary $50 off ** on 60-minute YogAstrology Consultations astrology readings for yogis this month. Apply complementary Code moongoddess. Click red Store tab at yogastrology.com.